AWS Service Catalog enables organizations to create and manage catalogs of IT services that are approved for use on AWS. These IT services can include everything from virtual machine images, servers, software, and databases to complete multitier application architectures. You can use AWS Service Catalog to centrally manage commonly deployed IT services. It also helps you achieve consistent governance and meet your compliance requirements, while enabling users to quickly deploy only the approved IT services they need. However, as the number of Service Catalog portfolios and products increases across an organization, centralized management and scaling can become a challenge. In this blog post, I walk you through a solution that simplifies management of AWS Service Catalog portfolios and related products. This solution also enables portfolio sharing with other accounts, portfolio tagging, and granting access to users. Finally, the solution delivers updates to the products using a continuous delivery in AWS CodePipeline. This enables you to maintain them in version control, thereby adopting “Infrastructure as Code” practices. Authors (developers, operations, architects, etc.) create the AWS CloudFormation templates based on the needs of their organizations. These templates are the reusable artifacts. They can be shared among various teams within the organizations. You can name these templates product-A.yaml or product-B.yaml. For example, if the template creates an Amazon VPC that is based on organization needs, as described in the Amazon VPC Architecture Quick Start, you can save it as product-vpc.yaml. The authors also define a mapping.yaml file, which includes the list of products that you want to include in the portfolio and related metadata. The mapping.yaml file is the core configuration component of this solution. This file defines your portfolio and its associated permissions and products. This configuration file determines how your portfolio will look in AWS Service Catalog, after the solution deploys it. A sample mapping.yaml is described here. Configuration properties of this mapping.yaml are explained here. The name of the folder must start with portfolio- because the AWS Lambda function iterates through all folders whose names start with portfolio-, and syncs them with AWS Service Catalog. Checking in any code in the repository triggers an AWS CodePipeline orchestration and invokes the Lambda function. The Lambda function downloads the code from version control and iterates through all folders with names that start with portfolio-. The function gets a list of all existing portfolios in AWS Service Catalog. Then it checks whether the display name of the portfolio matches the “name” property in the mapping.yaml under each folder. If the name doesn’t match, a new portfolio is created. If the name matches, the description and owner fields are updated and synced with what is in the file. There must be only one mapping.yaml file in each folder with a name starting with portfolio-. and 5. The Lambda function iterates through the list of products in the mapping.yaml file. If the name of product matches any of the products already associated with the portfolio, a new version of the product is created and is associated with the portfolio. If the name of the product doesn’t match, a new product is created. The CloudFormation template file (as specified in the template property for that product in the mapping file) is uploaded to Amazon S3 with a unique ID. A new version of the product is created and is pointed to the unique S3 path. Get started using this solution, which is available in this AWSLabs GitHub repository. Clone the repository. It contains the AWS CloudFormation templates that we use in this walkthrough. Examine mapping.yaml under the portfolio-infrastructure folder. Replace the account number with the account number with which to share the portfolio. To share the portfolio with multiple other accounts, you can append more account numbers to the list. These account numbers must be valid AWS accounts, and must not include the account number in which this solution is being created. Optionally, edit this file and provide the values you want for the name, description, and owner properties. You can also choose to leave these values as they are, which creates a portfolio with the name, description, and owners described in the file. Optional – If you don’t have the AWS Command Line Interface (AWS CLI) installed, install it as described here. To prepare your access keys or assumed role to make calls to AWS, configure the AWS CLI as described here. Create a pipeline. This orchestrates continuous integration with the AWS CodeCommit repository created in step 2, and continuously syncs AWS Service Catalog with the code. This creates the following resources. An AWS CodeCommit repository to push the code to. You can get the repository URL to push the code from the outputs of the stack that we just created. Connect, commit, and push code to this repository as described here. An S3 bucket, which holds the built artifacts (CloudFormation templates) and the Lambda function code. The AWS IAM roles and policies, with least privileges for this solution to work. An AWS CodeBuild project, which builds the Lambda function. This Python-based Lambda function has the logic, as explained earlier. 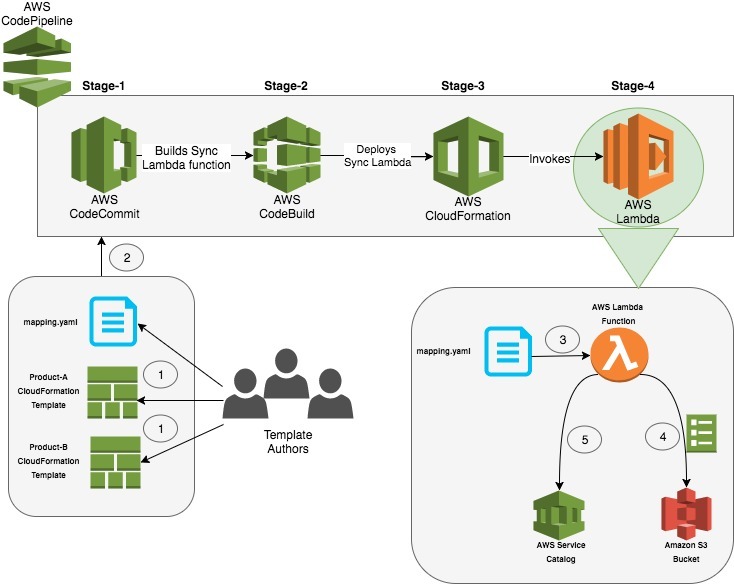 Stage-2: Builds the Lambda function using AWS CodeBuild, which has the logic to sync the AWS Service Catalog products and portfolios with code. Stage-3: Deploys the Lambda function using CloudFormation. Stage-4: Invokes the Lambda function. Once this stage completes successfully, you see an AWS Service Catalog portfolio and two products created, as shown below. Delete all the resources created earlier. Follow the steps in this blog post. The sample Lambda function, described here, is the same as what I explained in this post. You can use AWS Lambda to make API calls to AWS Service Catalog to keep portfolios and products in sync with a mapping file. The code includes the CloudFormation templates and the mapping file and folder structure, which resembles the portfolios in AWS Service Catalog. When checked in to an AWS CodeCommit repository, it invokes the Lambda function, orchestrated by AWS CodePipeline.